Because Termites spend most of their time underground and in the structure of homes or other structures, it is unlikely you will see them. However, there are a few signs if you know what to watch for. The signs are few, and include mud tubes, bubbling and peeling paint and discarded wings. It is possible to see them when they swarm in the spring, which lasts a short time, otherwise you are not likely to see them. Contact The Bug Dude for an inspection of your home, and treatment for either active infestations or preventative treatment. Our professionals can provide the pest control in Fort Worth that you need. 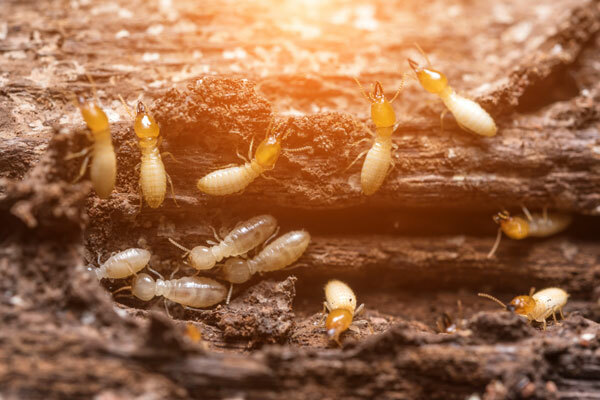 Termites consume cellulose-based plant materials, including the wood structure and finishing inside your home. The majority of homeowner’s insurance does not cover termite damage to your home. Considering you have so much invested in your home, professional pest control in Fort Worth is essential. The Bug Dude will provide a comprehensive inspection of your home, and a customized treatment plan. Our highly trained professionals can determine if you have an active infestation, and can develop a treatment plan for preventing future ones. There are three major types of termites in the U.S. The termite most people are familiar with is the subterranean, other major types include drywood and dampwood. In its natural environment, termites feed on dead plants and trees, thriving on the nutrients contained in the cellulose of wood and plants. They will also eat paper, drywall and plastics. However, some species of termites will feed on living trees. In the spring and summer, when a colony of termites has matured, you may see the winged reproductives’ swarming near windows and doors. They are attracted to light, and after breeding will establish a new colony or multiple colonies depending on the type of termite. Repair water leaks including leaking faucets. Divert the water produced by your home’s HVAC system to sewer/storm drainage when possible. Maintain clean, functional gutters and downspouts. In addition, divert water away from the home’s foundation. Maintain neatly trimmed shrubs, and clean planting beds near your home using rock or rubber mulch. Wood mulch provides food for termites. Seal all entry points to your home including around duct, water and sewer lines, cables and others. Keep firewood away from the home, stacked up off the ground, and clean up brush piles and clutter. In addition, have any tree stumps removed. Inspect wood fences and decks for damage. Damaged wood may sound hollow when tapped. To treat or prevent termites in and around your home, contact The Bug Dude for professional pest control in Fort Worth. Ladybugs are a vivid red in color, while Chinese beetles are a brownish orange, to a slight red in the younger beetles. Chinese beetles, also called Asian beetles, can cause an unpleasant odor when distressed. The beetles will hibernate through the winter in your home. In the early spring when it is still fairly cold outside, they abandon hibernation and try to enter your home. If you see these spotted insects in your home, they are beetles, and not ladybugs who die off in the fall. Chinese beetles eat aphids in your garden, but you don’t want them in your home. Winterize and seal your home to help keep them out. Repair or replace screens and use screen wire on foundation vents and plumbing vents. However, specialized wire is required for hot flues, such as a gas water heater or gas furnace. Professional pest control in Fort Worth can take care of a beetle infestation for you. Ticks are another insect that makes an appearance in early spring. Ticks are another reason to seal all cracks, gaps and potential entries in the home. They will also enter the home via pets and persons who have been outdoors. Inspect your pets and children when they have been outdoors. Be sure to check crevices, the neck under the hair and underneath clothing. Professional pest control in Fort Worth is the best means of eliminating ticks from your lawn. It will soon be that time of the year again, when mosquitoes plague us outdoors. Spring chores will assist you in reducing the number of breeding places for mosquitoes. Ensure all items that can hold water are emptied and put up. Remember, mosquitoes will breed in a tiny amount of water, and live in uncut grass. As you plant your flower beds this year, leave ample space for air to circulate, as this will also help minimize mosquitoes who often rest on vegetation during the daytime. Mosquitoes can transmit serious disease, such as Zika fever, encephalitis, yellow fever, malaria, filariasis, dengue fever and many more. Controlling mosquitoes requires a combined effort of source reduction and the use of chemical control products if required. Since mosquitoes lay their eggs in water, source reduction is aimed at eliminating water sources which promotes breeding. Source reduction is an effective mosquito treatment long term when maintained consistently, although the treatment plan provided by pest control in Fort Worth may also require chemicals. To prevent pests in your home, contact The Bug Dude for professional pest control in Fort Worth. Our pest control professionals serve Fort Worth, Dallas and the surrounding areas providing reliable pest control services. In addition, if you are having a problem with opossums, armadillos or other wildlife, contact The Bug Dude. We provide humane wild animal control services.